The old pump house for Belfast Reservoir Number One is seen from the Little River Community Trail in May 2013, in Belfast. The Belfast Water District superintendent said a recent sharp drop in the water level of the upper reservoir is temporary. 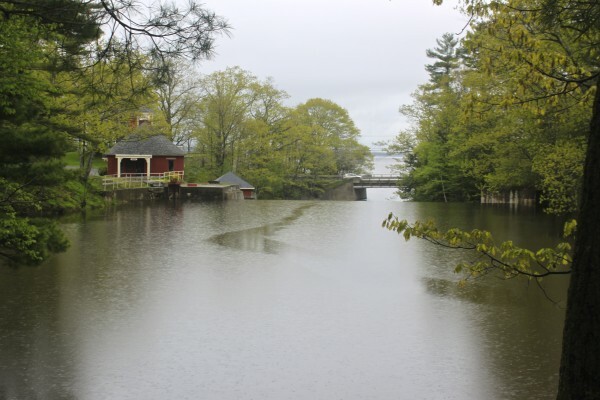 BELFAST, Maine — Would-be swimmers may be concerned by a recent sharp drop in the water level of the upper reservoir on Belfast’s Little River, but the Belfast Water District superintendent said the change is temporary. The Little River became the water source for Belfast in the 1880s, with water held in two reservoirs for the growing population. A century later, two drilled wells on the east side of the city became the sole sources of drinking water for Belfast, but the reservoirs continue to be maintained by the water district and used by residents who enjoy the recreation trail that wends past them. One of those residents, Dan Greeley, said last week that he was startled to see the dramatic change in the depth of the water when he tried to go for a swim. Pooler said the water district does its best to maintain the old dams, and while he doesn’t know yet exactly how much it will cost to resurface the dam on the upper reservoir, he’s pretty sure about one thing. “I can imagine that it’ll be expensive,” he said. Yet Belfast’s history suggests that the cost of not maintaining the dams could be higher. On October 17, 1943, after two days of steady rain had left both the upper and lower reservoirs at flood stage, another storm dropped four and a half inches of rain on the city, according to the website for the Belfast Water District. The heavy rain caused the water to rise five and a half feet over the spillway, which caused ten-foot granite blocks to fall off the lower dam. When the weakened dam gave way, the water from the reservoirs and the granite blocks from the dams were propelled toward the Route 1 bridge across the Little River. That water, combined with a high incoming tide, destroyed the bridge. The dam was replaced in 1944 for $50,000, which would have been about $674,000 in today’s dollars.